We are located on the outskirts of Skibbereen town, in a tranquil private setting, with ample safe and free parking, yet only two minutes drive from Skibbereen town or just 12 mins walk. 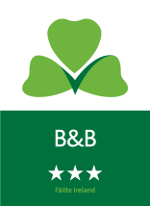 Marguerites B&B is an ideal base for your West Cork Holiday. We had a wonderful visit at Marguerite's. The breakfast was delicious and the courtyard beautiful and welcoming. Marguerite was a superb host offering directions and dinner advice. Happy surprise was to find her homemade crochet gifts of which we cannot wait to share with our family. Delightful visit! An absolutely wonderful stay, with Marguerite as our charming and helpful host. In a recent week-long visit to Ireland, Marguerite was the only host to offer us a cup of tea when we arrived, and it was truly appreciated. Also, I doubt if she had actually planned the full-arc rainbow that greeted us soon after our arrival, but we'll give her credit for that, too. Comfortable room, delicious breakfast, and fun conversation. Additionally, guests should avail themselves of her wonderful knitting and doily work. 10 stars, well earned. It was a really pleasant stay at this place. Thank you for the driving in the town center,and all the advices ! !